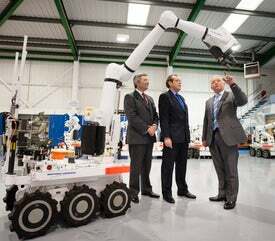 Northrop Grumman has rolled out its first CUTLASS unmanned explosive ordnance disposal (EOD) robot for the British Army at its unmanned ground systems production facility in Coventry, UK. Speaking at the ceremony, UK defence equipment, support and technology (DE&S) minister Peter Luff said CUTLASS’s launch represented a significant milestone in the MoD’s successful 20-year relationship with Northrop. "CUTLASS is a world-class product that will provide our UK-based bomb disposal teams with a state-of-the-art capability to help protect them and the public from the threat of explosive devices," Luff said. The CUTLASS is a six-wheeled, next-generation bomb disposal vehicle designed to replace the UK military’s Wheelbarrow UGV for conducting hazardous operations in all types of terrain and weather conditions. It can be integrated with multiple payloads, sensors and tools, enabling the operator to counter both vehicle-borne and improvised explosive devices (IEDs), and is capable of deliberately moving at slow speeds for sensitive missions. "CUTLASS will provide our UK-based bomb disposal teams with a state-of-the-art capability to help protect them and the public from the threat of explosive devices." The robot’s three-fingered advanced gripper-equipped manipulator arm offers nine degrees of freedom for greater movement and agility inside small spaces, such as the interior of a car. Northrop Grumman Information Systems Europe chief executive Danny Milligan said: "CUTLASS will significantly enhance the ability of users to defeat and dispose of unexploded ordnance and improvised explosive devices from a safe distance, and also to provide forensic information systems capability for national security and resilience." As part of a contract awarded in December 2006, Northrop is scheduled to deliver a total of 80 CUTLASS vehicles to the UK Ministry of Defence (MoD) for conducting anti-terrorism operations around the world. The company is also developing an export variant, which will be supplied either as a complete system or with the platform and payload offered separately. Image: Northrop Grumman officials and UK DE&S minister Peter Luff during the CUTLASS roll out ceremony in Coventry. Photo: Copyright © 2012 Northrop Grumman Corp.